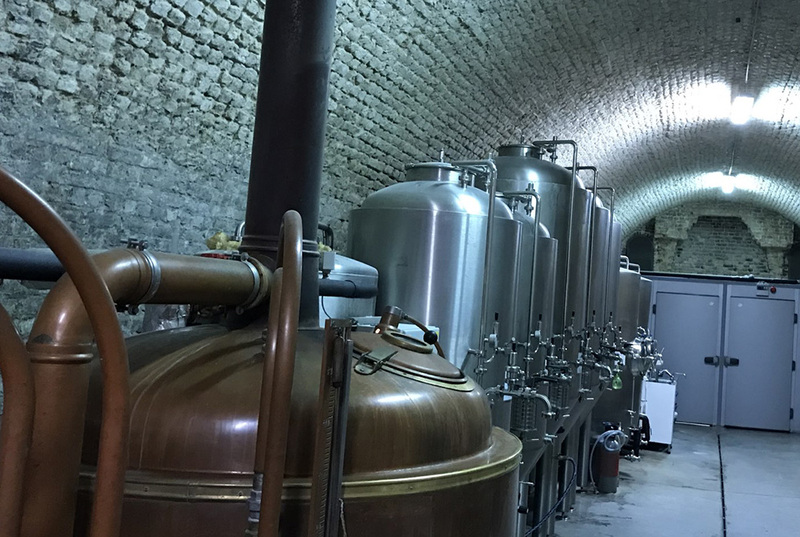 The Belgium city of Ypres sits in the middle of one of Flanders’ most productive brewing areas, in a corner of West Flanders famous for hop-growing, red-brown ales and the coveted Westvleteren, one of the world’s best beers. Yet the city has lacked one thing over the last couple of centuries: a brewery it could call its own. That changed in 2013, thanks to Hans Depypere, the owner of the Sint-Bernardus brewery, and Rudy Ghequire, manager and brewmaster at Rodenbach Brewery. Together they launched Brouwerij De Kazematten inside the 17th century fortifications of the city. (Kazematten is Dutch for casements, a fortified gun emplacement.) Ypres’ Houten Paard casements were constructed around 1680 by the great French military architect Sébastien Le Prestre de Vauban, fortifications engineer to Louis XIV. Over the centuries these basements were used to store ammunition and military equipment, and were used as sleeping quarters and shelter for the troops who defended Ypres during the many sieges. The British troop during the First World War used the casemates as “mess” for the officers. Their command post and field hospital were also based in Hotel de Remparts, as the kazematten were ironically called. It was also the home of the famous British trench gazette, The Wipers Times. Peaks and Pints has tapped De Kazematten’s Saison Baksteenwinkel, a copper blond, refreshing beer of 6.2 percent ABV. It has an earthy but pleasant mouthfeel, a lovely hay aroma and a dry bitterness on the finish that transforms this beer into a sublime thirst quencher.